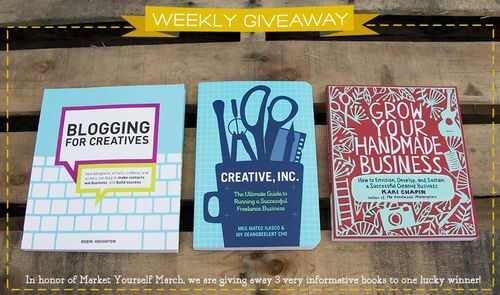 Keeping to our Market Yourself March theme, this week we'll hold a drawing to award one winner a bundle of three business books for creatives. As anyone who has tried to run a business can tell you, one of the key challenges you face is getting your work out there. Artists in particular have a tendency to focus on the process and on the product itself, which is the fun part. Selling yourself and getting known are, for many, the hard parts. The good news is that social media provides individual artists with a whole arsenal of free tools for promoting their work. The bad news, of course, is that the same set of tools is available to thousands and thousands of your fellow artists who are hoping to do the same thing. How do you stand out? How do you get noticed? The business books we're giving away this week can give you a great start in tackling the challenge. Fill out our entry form any time between now and Tuesday, March 19th and we'll announce a winner on Wednesday the 20th. Good luck! Grow Your Handmade Business: How to Envision, Develop, and Sustain a Successful Creative Business by Kari Chapin. Applying her trademark "you-can-do-it" coaching style to the nuts and bolts of business planning, Kari Chapin covers all of the issues involved in turning your creative hobby into a successful business–from mapping out a business plan to expanding production and distribution, finding funding, and addressing legal matters. With this definitive guide, you'll discover how to grow your business beyond the dining room table and finally quit your day job. Creative, Inc.: The Ultimate Guide to Running a Successful Freelance Business by Joy Deangdeelert Cho and Meg Mateo Ilasco. As the hipster classic Craft, Inc. did for crafters, this book will teach all types of creatives illustrators, photographers, graphic designers, animators, and more how to build a successful business doing what they love. Accessible, spunky, and packed with practical advice, Creative, Inc. is an essential for anyone ready to strike out on their own. Blogging for Creatives: How designers, artists, crafters and writers can blog to make contacts, win business and build success by Robin Houghton. Of the billions of internet users worldwide, a massive 80% are visiting blogs. The blogosphere has become a huge platform for individuals and businesses alike. Blogging for Creatives is the first approachable, non-techie guide to the blogosphere, complete with hundreds of tips, tricks and motivational stories from artistic bloggers who have started from scratch. Last week's winner of the amazing bundle of prizes from The Makerie Sewing Retreat was Stephanie Basden. Congratulations, Stephanie!